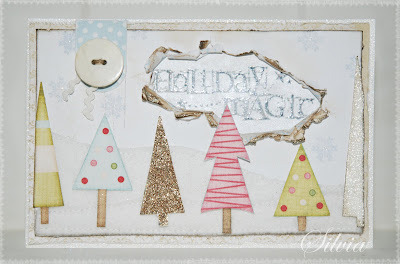 Shabby Chic Silvia: Holiday Magic & Salte Blog Candy!!! Holiday Magic & Salte Blog Candy!!! Bakgrunn: Hvit filt og stemplet Basic Grey Papir. Stempler ellers fra Fancy Pants. Møsterark fra Papirdesign MF og My Mind's Eye. Husk å stikke innom Linda Salte sin fantastiske blog! Hun har en spennende Blog Candy gående til 4. desember! I love how you have the words breaking through the paper! Beautiful colors, too! Your card with christmas trees is wonderful!!! Welcome to my blog! Please feel free to look around and leave a comment.